An airbag showing rips caused by shrapnel. There are still about 70 million cars in the United States equipped with Takata airbags that could prove fatal in even a minor accident, like the one that killed Huma Hanif, 17, fatally injured by shrapnel from the airbag when her Honda Civic rear-ended another car at low speed in Houston. 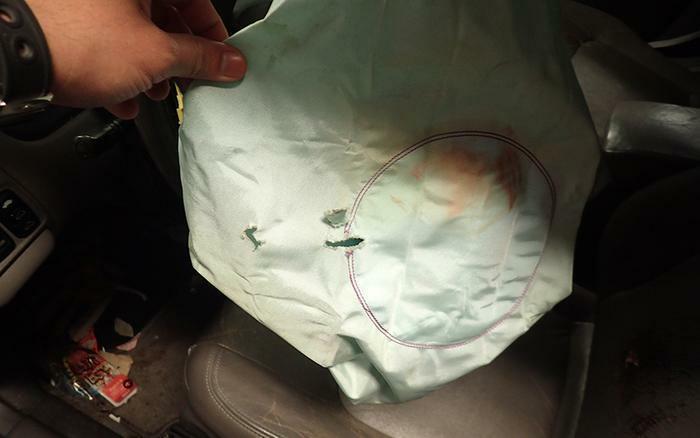 Airbags in older cars like Hanif's, about 300,000 of them, are the biggest problem -- they have a 50 percent chance of exploding, safety officials say. Takata itself is not in very good shape either. It is teetering on bankruptcy and seeking a buyer. This raises the question of who takes responsibility for the airbags if Takata goes away. Federal highway safety chief Mark Rosekind addressed that question in Detroit Wednesday, saying automakers have the "ultimate responsibility" for replacing the airbags, no matter what happens to Takata, Reuters reported. Rosekind also said he is concerned that not enough is being done to track down more than 300,000 older cars -- most of them Hondas and Acuras -- that have the most dangerous Takata airbags. Honda has said that it has made multiple mailings -- as many as 20 in some cases -- to owners of Hondas from the 2001 to 2003 model years, but many of the cars have been sold to new owners, raising concerns that the mailings may have gone astray. Honda now says it is about to start conducting home visits to owners of the older cars. The company also says it is looking for new ways to convince owners of recalled cars to get them fixed. Rosekind suggested it may be necessary to take mobile repair teams into neighborhoods to make the repairs, according to Reuters. Maybe safety officials should consider the tactic they used to get 16,000 recalled Volvo tractor-trailer trucks fixed when it was discovered that the steering could fail without warning. The Federal Motor Carrier Safety Administration (FMCSA) ordered the trucks off the road and roadside safety and weigh stations were alerted to carry out the order. All 16,000 of the trucks were fixed, the Department of Transportation announced on Nov. 1, the first time anyone can recall a car or truck recall campaign that was 100 percent successful. Many recalls stall or are delayed because dealers can't get parts and consumers either don't respond to mailings or don't receive them. Safety advocates have long called for a more aggressive program to ensure that critical safety recalls are completed quickly and completely, meaning that all of the recalled vehicles are actually fixed, something that rarely happens now. Sen. Bill Nelson (D-Fla.), a senior member of the Commerce Committee, wrote to the head of NHTSA two years ago urging him to require automakers to provide consumers with loaner cars or rental-car reimbursement if they could not get their cars fixed immediately. Nelson then wrote to Transportation Secretary Anthony Foxx urging him to impose civil penalties on any company that refused to provide drivers with an alternate form of transportation while they wait for their cars to be repaired. Neither idea was implemented, although Honda and some other manufacturers are urging dealers to provide rentals or loaners while airbag recalls are carried out. Senators Edward J. Markey (D-Mass.) and Richard Blumenthal (D-Conn.), members of the Commerce, Science and Transportation Committee, have called the National Highway Traffic Safety Administration's recall rate "abysmal" and have called on NHTSA to accelerate its efforts. "Takata has lied to cover up problems with its airbags and NHTSA has aided this malfeasance with an inept and illogical recall process. NHTSA’s recall rate is abysmal and it is in part responsible for this most recent death," they said in a statement after Huma Hanif's death became the tenth attributed to Takata airbags in the U.S. The most recent reported U.S. fatality also involved an older Honda Civic, a 2001 model driven by a 50-year-old woman killed Sept. 30 in Riverside County, Calif. Honda said it had sent 20 recall notices to the registered owner of that car but the recall was never completed. Many of the fatalities are occurring in hot and humid locations, like Texas and Florida. In Houston, Serena Martinez filed suit this week seeking compensation for the injuries she suffered when the airbag in her 2002 Honda Accord exploded. Heat and humidity cause ammonium nitrate, the propellant used in the recalled airbags, to break down, making it more susceptible to detonation.